The school also praised former Navy SEAL diver Lt Commander Saman Kunan, who died during the hazardouse operation. A minute’s silence was observed in recognition of Saman’s sacrifice. Unsworth was praised for being instrumental in planning the mission and bringing to bear his expertise in cave diving. Unsworth said he was among the first to join the effort after the boys were reported missing in the cave because he’d explored it in 2016 – at a time, he noted, when it was not as badly flooded as it was during the rescue mission. So he used his experiences from that time to search for the boys. He told youngsters attending the presentation to avoid the cave during the rainy season and make sure someone in authority is notified is they ever plan to visit. It’s important to know about a cave before you enter it, the Briton said. 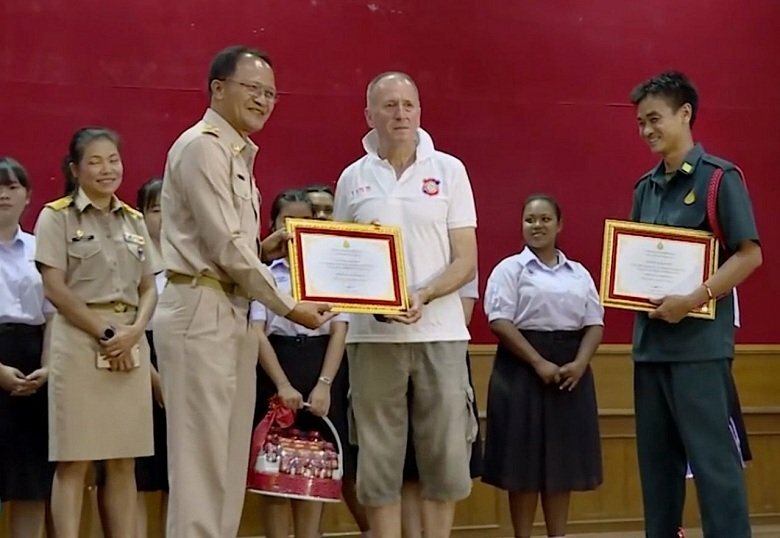 Also praised for his dedication and given a certificate was Kamon Kunngamkwamdee, a former security guard in Tham Luang-Nang Norn Forest Park, where the cave is situated. Kamon, who now works as janitor at the school, was among the first people to go to the cave in hope of finding the missing boys. Nice to see that recognition for efforts for those that deserve it are being awarded by people and institutions at many levels. I guess Elon Musk was either accidentally forgotten in today's honours, or maybe he was too busy ensconced with his defamation lawyers or anger management psychiatrists to be able to make it. Well done Vernon for getting it in motion. His timely call for the best help in the world was probably the turning point in the outcome. Respect to the main guy but <deleted> is a security guard who obviously done no more than say,errrr I think they might be in that big cave because there's 12 bycicles left outside.good to see he got some recognition and promoted to school janitor and no doubt a big medal. They were incredibly fortunate that someone who understands cave rescue and has contacts in that field just happened to be living in Chiang Rai ... well done Vern, great job.